When making homemade pasta you will need to decide what type of flour you want to use. If making a flavored pasta that requires something other than a different variety of flour, you will need to purchase the necessary flavoring agent. The following information will help you make some of these decisions. There are several choices of flour that can be used when making pasta. Each affects the color, flavor and texture in a different manner. The chart below shows some of the different flours that are available and gives a description of each. A standard baking flour made from red winter wheat. Unbleached flour has not gone through all the processing that bleached flour has, so it produces firmer dough. 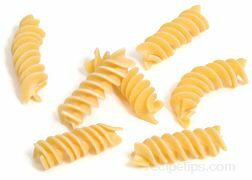 Unbleached white flour produces creamy beige colored pasta with a basic pasta flavor. It is used more often than semolina flour when making homemade pasta because it produces dough that is easier to handle. Semolina flour is ground from hard durum winter wheat. Semolina flour produces stronger dough because it contains a high level of gluten, which adds elasticity to the dough. Dough made from semolina flour is easier to form into different shapes and can be sent through an electric pasta machine but it is too hard to handle when rolling out by hand because of its stickiness. Semolina flour can be mixed with unbleached white flour to produce strong dough that is easier to handle when making handmade pasta. Whole wheat flour contains more vitamins and fiber than unbleached flour because it is ground from the whole grain, including the husk of the grain. Whole wheat flour is available in several different grinds. Pasta dough made with the coarser grind is generally used to produce flat noodles and the finer grinds work well for most all shapes. Whole wheat flour produces heavier pasta, which most often requires a little more water added to the dough. 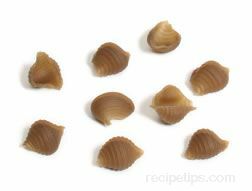 The pasta produced when using whole wheat flour will have a nuttier flavor than pasta produced using unbleached flour or semolina flour. Buckwheat flour produces pasta with a strong nutty flavor. The flour has been ground from toasted buckwheat seeds and produces pasta dough with a fairly gritty texture. 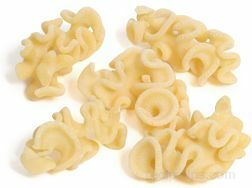 The dough is difficult to handle, similar to coarse ground whole wheat flour, so it is generally used to produce wide and thick ribbon pastas. To produce a slightly smoother texture with a lighter flavor, it can be mixed with unbleached or finely ground whole wheat flour. Oat flour provides flour that is high in fiber. It is used in the same manner that coarse ground whole wheat flour is used. It will produce a nutty flavored, heavy textured pasta that has a deeper color than pasta made with whole wheat flour. Brown rice flour is made from rice that has only the inedible hull removed. It is perishable, so it should be stored in the refrigerator or freezer. The flour is high in fiber and produces pasta dough similar to whole wheat pasta, except the dough made from brown rice flour is a little stickier. Pasta dough made with brown rice flour works best for making flat ribbon pasta. 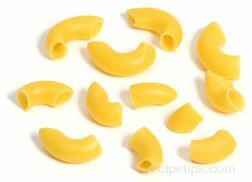 The pasta has a slightly sweet flavor and is tan or light brown in color. If brown rice flour is not available in a local food store, check for availability in an Asian market or health food store. White, fine sandy textured flour produced from finely ground rice. It does not contain any gluten and produces a noodle that is translucent in appearance. The rice noodles produced from rice flour are fairly brittle and need to be soaked in hot water to soften before they are used in stir-fries or soups. They can also be deep-fried but do not require soaking prior to frying. Noodles made from rice flour are most often used in Asian dishes. If rice flour is not available in a local food store, check for availability in an Asian market. Corn meal is used to add nutrition and a slight nut-like flavor to the pasta. Corn meal is always mixed sparingly with flour so the pasta dough does not become too grainy. If the dough is too grainy it becomes difficult to roll out or extrude from a machine. Corn meal dough works best for making flat noodles. The type of flour used in making the dough determines the base color. The amount and type of corn meal added will determine how much affect it will have on the color. The corn meal may just add specks of yellow, white or blue to the dough, rather than affect the overall color. Eggs: Eggs add nutritional value to the pasta and provide for a rich creamy color. 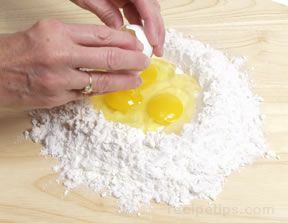 Most recipes for pasta are based on large size eggs. If you use a larger or smaller size, you may have to adjust the amount of flour you use when making the dough. Eggs are generally available in medium, large, and extra large. Purchase the freshest eggs possible when making pasta. 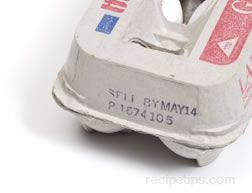 Check the carton for the "sell by date" to ensure freshness. Oil: Oil is not essential in making good pasta but when added, the texture of the pasta is smoother and silkier. It will also produce dough that extrudes for the pasta machine easier. Olive oil is used to enhance the flavor. Choose a pure or plain olive oil, which is best suited for cooked foods. Canola oil is a good choice when you want a more bland flavor. Spinach: Select enough fresh spinach to produce approximately 3/8 cup (6 tablespoons) of pureed spinach. When selecting fresh spinach, choose leaves that are dark green and crisp, avoiding limp, damaged or yellow spotted leaves. Frozen spinach can also be used in place of fresh spinach. Thaw the frozen spinach, drain well and puree it. Broccoli: Select enough fresh broccoli to produce ¼ cup of finely chopped, steamed broccoli. Choose broccoli with a deep green color throughout and a firm stalk. Avoid any broccoli that has yellow areas or brown spots. 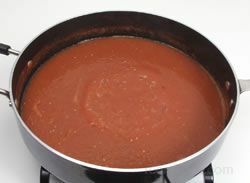 Tomato: Tomato pasta requires approximately two or three tablespoons of tomato paste. Sun-dried tomatoes can also be used. It requires 2 tablespoons of pureed sun-dried tomatoes that have been soaked and well drained prior to being pureed. Beets: Select one medium size beet or 2 small beets and peel, cook, and puree before adding to the pasta dough. Beets can generally be found during most of the year, but are most readily available during the summer and throughout the fall. To be assured that the beets selected are fresh, select beets with greens still attached. If the greens are crisp and fresh in appearance, you can be assured the beets are fresh. Carrots: Purchase enough carrots to produce approximately ½ cup of pureed cooked carrots. The pureed carrots can be substituted with 3/8 cup of fresh carrot juice. If selecting fresh carrots, select small to medium size carrots, avoiding the larger carrots, which can be tough and not as sweet as the smaller sizes. The carrots should be firm textured and not easily bent. Avoid any that are dry and split at the ends. If greens are still attached, they should be crisp and fresh in appearance, indicating they have recently been dug. Bell Peppers: Select one bell pepper to be stemmed, seeded, cut into small pieces and pureed. When choosing a pepper, select any color you desire, avoiding peppers that have skin that is beginning to shrivel or any that contain blemishes. Chile Peppers: Choose four chile peppers of the type you prefer. The peppers are seeded, stems discarded and then either pureed or chopped to very fine pieces. When selecting peppers, choose those that are firm and free of blemishes. Note: When handling chile peppers, be sure to keep exposed hands away from the eye area and other sensitive areas of the body, such as nose and lips. The chile oil that your hands are exposed to can cause severe irritation. Wash hands immediately after exposure or wear rubber gloves to protect against exposure. Garlic: You will need a head of garlic of which you will need 2 to 4 cloves to be finely crushed or minced. Choose a firm, fresh head of garlic that does not contain any green sprouts. The head should be free of spots and the skin should be attached. Other forms of garlic are available, such as flakes, powder and paste, but it is best to use fresh garlic when making pasta. Herbs: For herb pasta, you will need approximately ½ cup of finely chopped herbs. You can use one herb or a combination of two or more to flavor the pasta. Some of the herbs that work well are basil, mint, oregano, parsley, rosemary, sage, and thyme. Select herbs according to personal preference or as requested by a specific recipe. Be sure the herbs you select are fresh, avoiding herbs that are damaged or blemished. Curry: Curry powder is a spice blend, which can be made up of anywhere from 5 to 50 spices. Commercially, it can be purchased already blended but you can also mix your own preference in spices to make your own special fresh blend. The most common spices found in a curry blend are cinnamon, coriander, cumin, turmeric, pepper, cardamom, cloves, ginger, and nutmeg. Blends will vary according to regions and local traditions. Other spices used are aniseed, bay leaf, caraway, cayenne pepper, fennel, fenugreek, mace, mustard seed, poppy seeds, and saffron. Stored curry powder will lose some of its flavor so if using stored or commercial curry powder you will need 1 to 1 ¼ teaspoons and if using fresh curry powder, you will need to add approximately ¾ teaspoon to the pasta dough. Saffron: Saffron is a spice that is orange in color, which creates pasta with a golden tint. It produces a slightly bitter but very distinctive taste. Saffron can be purchased in threads or powder form. To flavor the pasta, you will need a good size pinch of threads ground to a powder or approximately 3/8 of a teaspoon of powdered saffron. Lemon: For lemon flavored pasta, purchase two lemons whose zest will be used to add to the pasta dough. Select lemons with an entirely yellow peel that have a slightly glossy tint. They should be firm and feel heavy for their size. The peel should be close-grained because a coarse grained peel indicates that the lemon has a thick skin and a smaller amount of flesh. Avoid lemons with blemishes and dull dark yellow peel, indicating the lemons are not fresh. Strawberry: Purchase a quantity of strawberries that will supply 2/3 cup of strawberries with stems trimmed and berries cut in half. Choose richly colored strawberries that have a slight shine. Overripe strawberries will have a dull appearance. Check the strawberries for bruising and mold spots. Try to select a group of strawberries all at the same ripeness level, otherwise some will become too ripe by the time the less ripe berries are fully ripe. The flavoring agents above are just some of what can be used to add flavor when making homemade pasta. You can experiment with other flavorings to create your own unique flavor.